You know, I have all these great posts queued up, ready to be deployed at a moment's notice...and I keep discovering even more awesome things I need to post first. 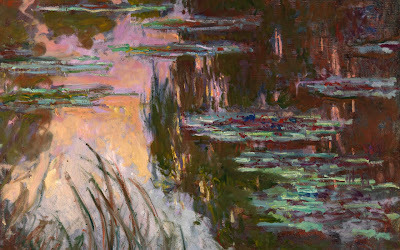 Yesterday's discovery is over a century old, but it's new to me: Monet's Water Lilies, Setting Sun. I wish the photos I've found of it online even remotely did it justice, but they all look too drab and muddy. In actuality, it's gorgeous and vibrant and colorful, full of reds and pinks and greens and golds. Really conveyed the impression of a sunset reflected in the flower-strewn water. I highly recommend a trip to The National Gallery (where it's a recent acquisition) specifically to take a look in person. Not that there aren't plenty of other things to see there as well, but it's worth a special trip.